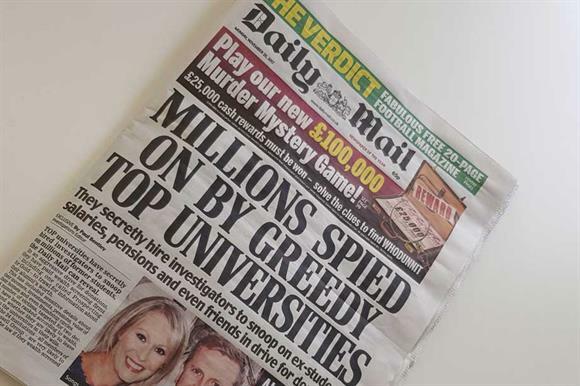 The Institute of Fundraising has defended a group of top UK universities after the Daily Mail newspaper accused them of "spying" on alumni through wealth screening. In an article published on its front page this morning, the newspaper claimed that 24 members of the Russell Group of top universities had paid wealth-screening firms to assess how much money former students were earning and how likely they were to be able to donate. Over the past year, the Information Commissioner’s Office has fined 13 charities for breaking data-protection law through practices such as wealth screening without informing data subjects. The practice of wealth screening is not in itself illegal but does breach the Data Protection Act if the person being investigated is not made aware that their data could be used in this way. The Daily Mail article acknowledges this, saying that the universities are "very likely to have broken the law" if they have carried out wealth screening when people could not reasonably have expected them to. A number of the universities mentioned have privacy statements that could be viewed online, the newspaper reports. Daniel Fluskey, head of policy at the IoF, said in a statement today that the research highlighted by the Daily Mail was "a needed and increasingly important part" of fundraising for universities and charities. "It is important because it gives donors an ever better experience of giving, as well as helping organisations to raise money in a more efficient way," he said. "Time and again, evidence shows that individuals want and expect that fundraisers have an understanding about them and are able to ask for their support in the right way, tailored to their interests and ability to donate. This is particularly the case for those who choose to give large amounts to the causes they care about." Fluskey said the only way that this sort of fundraising was possible was through research, and the IoF welcomed discussions about developing supporter relationships while also ensuring data-protection regulations were followed in both letter and spirit. Elizabeth Denham, the Information Commissioner, said she was looking into the 24 universities named in the article, which included Oxford, Cambridge, Durham, Edinburgh and Bristol. In a statement, she said: "We will look carefully at the individual evidence provided by the Daily Mail to see if, and where, any rules have been broken and what learning there is for wider practice in this area. "Personal data belongs to the individual, and that means they have the right to make choices about how it's used. The law requires organisations to tell people what it’s going to be used for and who it’s going to be shared with – and that's what people expect. "Profiling individuals for a fundraising campaign is not against the law, but failing to clearly tell people that you’re going to do it is." Denham said her office had been working with the Fundraising Regulator and talking to universities about their responsibilities in relation to transparency and accountability in preparation for the introduction of the General Data Protection Regulation, which is due to come into force in May. A spokesman for the Fundraising Regulator confirmed this and said that, as exempt charities, universities had a responsibility to maintain public trust, which included obeying a legal duty to inform someone if their personal data was being processed, and to respect the rights of individuals who did not want their data used in this way. Tricia King, vice president, global engagement, at the Council for Advancement and Support of Education, a membership body that works with universities on fundraising best practice, said many alumni were proud to support the work of their former universities and wanted to be contacted. "In our experience, universities take the privacy of their alumni and other philanthropists very seriously," she said.